Researchers from Yale [University]-NUS College and the University of Fribourg in Switzerland have discovered a novel colour-generation mechanism in nature, which if harnessed, has the potential to create cosmetics and paints with purer and more vivid hues, screen displays that project the same true image when viewed from any angle, and even reduce the signal loss in optical fibres. Yale-NUS College Assistant Professor of Science (Life Science) Vinodkumar Saranathan led the study with Dr Bodo D Wilts from the Adolphe Merkle Institute at the University of Fribourg. Dr Saranathan examined the rainbow-coloured patterns in the elytra (wing casings) of a snout weevil from the Philippines, Pachyrrhynchus congestus pavonius, using high-energy X-rays, while Dr Wilts performed detailed scanning electron microscopy and optical modelling. They discovered that to produce the rainbow palette of colours, the weevil utilised a colour-generation mechanism that is so far found only in squid, cuttlefish, and octopuses, which are renowned for their colour-shifting camouflage. P. c. pavonius, or the “Rainbow” Weevil, is distinctive for its rainbow-coloured spots on its thorax and elytra (see attached image). These spots are made up of nearly-circular scales arranged in concentric rings of different hues, ranging from blue in the centre to red at the outside, just like a rainbow. While many insects have the ability to produce one or two colours, it is rare that a single insect can produce such a vast spectrum of colours. Researchers are interested to figure out the mechanism behind the natural formation of these colour-generating structures, as current technology is unable to synthesise structures of this size. Dr Saranathan and Dr Wilts examined these scales to determine that the scales were composed of a three-dimensional crystalline structure made from chitin (the main ingredient in insect exoskeletons). They discovered that the vibrant rainbow colours on this weevil’s scales are determined by two factors: the size of the crystal structure which makes up each scale, as well as the volume of chitin used to make up the crystal structure. Larger scales have a larger crystalline structure and use a larger volume of chitin to reflect red light; smaller scales have a smaller crystalline structure and use a smaller volume of chitin to reflect blue light. According to Dr Saranathan, who previously examined over 100 species of insects and spiders and catalogued their colour-generation mechanisms, this ability to simultaneously control both size and volume factors to fine-tune the colour produced has never before been shown in insects, and given its complexity, is quite remarkable. “It is different from the usual strategy employed by nature to produce various different hues on the same animal, where the chitin structures are of fixed size and volume, and different colours are generated by orienting the structure at different angles, which reflects different wavelengths of light,” Dr Saranathan explained. The research was partly supported though the National Centre of Competence in Research “Bio-Inspired Materials” and the Ambizione program of the Swiss National Science Foundation (SNSF) to Dr Wilts, and partly through a UK Royal Society Newton Fellowship, a Linacre College EPA Cephalosporin Junior Research Fellowship, and Yale-NUS College funds to Dr Saranathan. Dr Saranathan is currently part of a research team led by Yale-NUS College Associate Professor of Science Antonia Monteiro, which has recently been awarded a separate Competitive Research Programme (CRP) grant by Singapore’s National Research Foundation (NRF) to examine the genetic basis of the colour-generation mechanism in butterflies. Dr Saranathan and Dr Monteiro are both also from the Department of Biological Sciences at the National University of Singapore (NUS) Faculty of Science. In addition, Dr Saranathan is affiliated with the NUS Nanoscience and Nanotechnology Initiative. This entry was posted in biomimcry, nanotechnology and tagged Antónia Monteiro, Bodo D Wilts, butterflies, chitin, colour-generation mechanism, colour-shifting camouflage, crystal structure, cuttlefish, elytra (wing casings), insect exoskeletons, Literal Elytral Rainbow: Tunable Structural Colors Using Single Diamond Biophotonic Crystals in Pachyrrhynchus congestus Weevils, National University of Singapore (NUS), octopuses, P. c. pavonius (Rainbow Weevil), Pachyrrhynchus congestus pavonius (P. c. pavonius), Philippines, rainbow palette of colours, Singapore, Singapore’s National Research Foundation (NRF), snout weevil, squid, Swiss National Science Foundation (SNSF), Switzerland, UK Royal Society, University of Fribourg, US, Vinodkumar Saranathan, Yale University, Yale-NUS College on April 15, 2019 by Maryse de la Giroday. A new form of solar-powered supercapacitor could help make future wearable technologies lighter and more energy-efficient, scientists say. In a paper published in the journal Nano Energy, researchers from the University of Glasgow’s Bendable Electronics and Sensing Technologies (BEST) group describe how they have developed a promising new type of graphene supercapacitor, which could be used in the next generation of wearable health sensors. Currently, wearable systems generally rely on relatively heavy, inflexible batteries, which can be uncomfortable for long-term users. The BEST team, led by Professor Ravinder Dahiya, have built on their previous success in developing flexible sensors by developing a supercapacitor which could power health sensors capable of conforming to wearer’s bodies, offering more comfort and a more consistent contact with skin to better collect health data. Their new supercapacitor uses layers of flexible, three-dimensional porous foam formed from graphene and silver to produce a device capable of storing and releasing around three times more power than any similar flexible supercapacitor. The team demonstrated the durability of the supercapacitor, showing that it provided power consistently across 25,000 charging and discharging cycles. They have also found a way to charge the system by integrating it with flexible solar powered skin already developed by the BEST group, effectively creating an entirely self-charging system, as well as a pH sensor which uses wearer’s sweat to monitor their health. Professor Dahiya said: “We’re very pleased by the progress this new form of solar-powered supercapacitor represents. A flexible, wearable health monitoring system which only requires exposure to sunlight to charge has a lot of obvious commercial appeal, but the underlying technology has a great deal of additional potential. In addition to the team’s work on robots, prosthetics, and graphene ‘skin’ mentioned in the May 10, 2017 posting the team is working on a synthetic ‘brainy’ skin for which they have just received £1.5m funding from the Engineering and Physical Science Research Council (EPSRC). A robotic hand covered in ‘brainy skin’ that mimics the human sense of touch is being developed by scientists. University of Glasgow’s Professor Ravinder Dahiya has plans to develop ultra-flexible, synthetic Brainy Skin that ‘thinks for itself’. The super-flexible, hypersensitive skin may one day be used to make more responsive prosthetics for amputees, or to build robots with a sense of touch. Brainy Skin reacts like human skin, which has its own neurons that respond immediately to touch rather than having to relay the whole message to the brain. This electronic ‘thinking skin’ is made from silicon based printed neural transistors and graphene – an ultra-thin form of carbon that is only an atom thick, but stronger than steel. The new version is more powerful, less cumbersome and would work better than earlier prototypes, also developed by Professor Dahiya and his Bendable Electronics and Sensing Technologies (BEST) team at the University’s School of Engineering. His futuristic research, called neuPRINTSKIN (Neuromorphic Printed Tactile Skin), has just received another £1.5m funding from the Engineering and Physical Science Research Council (EPSRC). Professor Dahiya said: “Human skin is an incredibly complex system capable of detecting pressure, temperature and texture through an array of neural sensors that carry signals from the skin to the brain. “Inspired by real skin, this project will harness the technological advances in electronic engineering to mimic some features of human skin, such as softness, bendability and now, also sense of touch. This skin will not just mimic the morphology of the skin but also its functionality. This latest advance means tactile data is gathered over large areas by the synthetic skin’s computing system rather than sent to the brain for interpretation. To achieve this, Professor Dahiya will add a new neural layer to the e-skin that he has already developed using printing silicon nanowires. EPSRC is the main funding body for engineering and physical sciences research in the UK. By investing in research and postgraduate training, the EPSRC is building the knowledge and skills base needed to address the scientific and technological challenges facing the nation. Its portfolio covers a vast range of fields from healthcare technologies to structural engineering, manufacturing to mathematics, advanced materials to chemistry. The research funded by EPSRC has impact across all sectors. It provides a platform for future UK prosperity by contributing to a healthy, connected, resilient, productive nation. 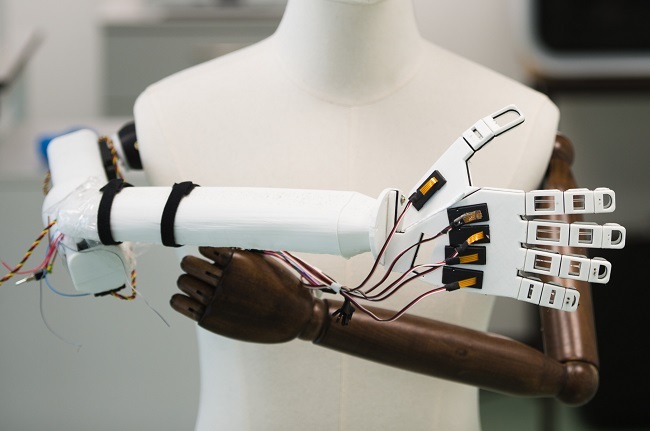 It’s fascinating to note how these pieces of research fit together for wearable technology and health monitoring and creating more responsive robot ‘skin’ and, possibly, prosthetic devices that would allow someone to feel again. This entry was posted in biomimcry, electronics, energy, graphene, human enhancement, nanotechnology, robots and tagged [UK] Engineering and Physical Science Research Council (EPSRC), advanced prosthetics, amputees, artificial intelligence, batteries, bendability, Bendable Electronics and Sensing Technologies (BEST), brainy skin, Carlos García Núñez, e-skin, electronic thinking skin, EPSRC, flexible electronics, Flexible self-charging supercapacitor based on graphene-Ag-3D graphene foam electrodes, flexible solar powered skin, flexible synthetic skin, flexible wearable health monitoring system, graphene supercapacitor, human skin, hybrid electric vehicles, Libu Manjakka, neuPRINTSKIN (Neuromorphic Printed Tactile Skin), neural sensors, neurons, next generation computing, prosthetics, Ravinder Dahiya, robotic hand, robots with a sense of touch, Scotland, self-charging system, silicon based printed neural transistors, silicon nanowires, silver, softness, solar power, solar-powered supercapacitor, supercapacitor, sweat, synthetic brainy Skin, synthetic skin, tactile data, tactile skin, touch, UK, University of Glasgow, wearable health sensor, wearable systems, wearable technologies, Wenting Dang on February 6, 2019 by Maryse de la Giroday. A species of silk moth has evolved special sound absorbing scales on its wings to absorb the sonar pulses from hunting bats. This is analogous to the special coatings on stealth aircraft that allow them to be nearly invisible to radar. “It’s a battle out there every night, insects flying for their lives trying to avoid becoming a bat’s next dinner,” said Dr. Marc Holderied, the senior author on the paper and an associate professor in the School of Biological Sciences at the University of Bristol. Many moths have ears that warn them when a bat is nearby. But not the big and juicy cabbage tree emperor moths which would ordinarily make the perfect meal for bats. Moths are a mainstay food source for bats, which use echolocation (biological sonar) to hunt their prey. Scientists such as Thomas Neil, from the University of Bristol in the U.K., are studying how moths have evolved passive defenses over millions of years to resist their primary predators. While some moths have evolved ears that detect the ultrasonic calls of bats, many types of moths remain deaf. In those moths, Neil has found that the insects developed types of “stealth coating” that serve as acoustic camouflage to evade hungry bats. Neil will describe his work during the Acoustical Society of America’s 176th Meeting, held in conjunction with the Canadian Acoustical Association’s 2018 Acoustics Week, Nov. 5-9 at the Victoria Conference Centre in Victoria, Canada. In his presentation, Neil will focus on how fur on a moth’s thorax and wing joints provide acoustic stealth by reducing the echoes of these body parts from bat calls. “Thoracic fur provides substantial acoustic stealth at all ecologically relevant ultrasonic frequencies,” said Neil, a researcher at Bristol University. “The thorax fur of moths acts as a lightweight porous sound absorber, facilitating acoustic camouflage and offering a significant survival advantage against bats.” Removing the fur from the moth’s thorax increased its detection risk by as much as 38 percent. Neil used acoustic tomography to quantify echo strength in the spatial and frequency domains of two deaf moth species that are subject to bat predation and two butterfly species that are not. In comparing the effects of removing thorax fur from insects that serve as food for bats to those that don’t, Neil’s research team found that thoracic fur determines acoustic camouflage of moths but not butterflies. Neil’s research could contribute to the development of biomimetic materials for ultrathin sound absorbers and other noise-control devices. The wings of moths and butterflies are densely covered in scales that exhibit intricate shapes and sculptured nanostructures. While certain butterfly scales create nanoscale photonic effects [emphasis mine], moth scales show different nanostructures suggesting different functionality. Here we investigate moth-scale vibrodynamics to understand their role in creating acoustic camouflage against bat echolocation, where scales on wings provide ultrasound absorber functionality. For this, individual scales can be considered as building blocks with adapted biomechanical properties at ultrasonic frequencies. The 3D nanostructure of a full Bunaea alcinoe moth forewing scale was characterized using confocal microscopy. Structurally, this scale is double layered and endowed with different perforation rates on the upper and lower laminae, which are interconnected by trabeculae pillars. From these observations a parameterized model of the scale’s nanostructure was formed and its effective elastic stiffness matrix extracted. Macroscale numerical modeling of scale vibrodynamics showed close qualitative and quantitative agreement with scanning laser Doppler vibrometry measurement of this scale’s oscillations, suggesting that the governing biomechanics have been captured accurately. Importantly, this scale of B. alcinoe exhibits its first three resonances in the typical echolocation frequency range of bats, suggesting it has evolved as a resonant absorber. Damping coefficients of the moth-scale resonator and ultrasonic absorption of a scaled wing were estimated using numerical modeling. The calculated absorption coefficient of 0.50 agrees with the published maximum acoustic effect of wing scaling. Understanding scale vibroacoustic behavior helps create macroscopic structures with the capacity for broadband acoustic camouflage. Those nanoscale photonic effects caused by butterfly scales are something I’d usually describe as optical effects due to the nanoscale structures on some butterfly wings, notably those of the Blue Morpho butterfly. In fact there’s a whole field of study on what’s known as structural colo(u)r. Strictly speaking I’m not sure you could describe the nanostructures on Glasswing butterflies as an example of structure colour since those structures make that butterfly’s wings transparent but they are definitely an optical effect. For the curious, you can use ‘blue morpho butterfly’, ‘glasswing butterfly’ or ‘structural colo(u)r’ to search for more on this blog or pursue bigger fish with an internet search. This entry was posted in biomimcry, nanotechnology and tagged acoustics, bats, bioinspired engineering, Biomechanics of a moth scale at ultrasonic frequencies, biomimetics, blue morpho butterfly, Bruce W. Drinkwater, Bunaea alcinoe, cabbage tree emperor moth, Daniel Robert, echolocation, glasswing butterfly, Marc W. Holderied, mohts, sonar, sound absorption, structural colour, Thomas R. Neil, University of Bristol, Zhiyuan Shen on January 2, 2019 by Maryse de la Giroday. Researchers at Queen Mary University of London [UK][ have developed a new way to grow mineralised materials which could regenerate hard tissues such as dental enamel and bone. However, unlike other tissues of the body, enamel cannot regenerate once it is lost, which can lead to pain and tooth loss. These problems affect more than 50 per cent of the world’s population and so finding ways to recreate enamel has long been a major need in dentistry. The materials could be used for a wide variety of dental complications such as the prevention and treatment of tooth decay or tooth sensitivity – also known as dentin hypersensitivity. The mechanism that has been developed is based on a specific protein material that is able to trigger and guide the growth of apatite nanocrystals at multiple scales – similarly to how these crystals grow when dental enamel develops in our body. This structural organisation is critical for the outstanding physical properties exhibited by natural dental enamel. One final comment, this work is at the ‘in vitro’ stage. More colloquially, this is being done in a petri dish or glass vial or some other container and it’s going to be a long time before there are going to be any human clinical trials, assuming the work gets that far. This entry was posted in biomimcry, medicine, nanotechnology and tagged Alistair Rice, Alvaro Mata, Andy J. Bushby, apatite nanocrystals, Armando del Río Hernández, bone regeneration, dental enamel regeneration, dentin hypersensitivity. Sherif Elsharkawy, Esther Tejeda-Montes, Ettore Barbieri, Hasan Jamal, Jose C. Rodriguez-Cabello, Khushbu Mehta, Kseniya Shuturminska, Maisoon Al-Jawad, Maria F. Pantano, Matilde Alonso, Molly M. Stevens, Nadezda V. Tarakina, natural dental enamel, Nicola M. Pugno, Paul Anderson, Protein disorder–order interplay to guide the growth of hierarchical mineralized structures, Queen Mary University of London, Rory M. Wilson, Sherif Elsharkawy, Shweta Agarwal, teeth, tooth decay, tooth sensitivity, UK on November 21, 2018 by Maryse de la Giroday. Studies have shown that the wings of dragonflies and cicadas prevent bacterial growth due to their natural structure. The surfaces of their wings are covered in nanopillars making them look like a bed of nails. When bacteria come into contact with these surfaces, their cell membranes get ripped apart immediately and they are killed. This inspired researchers from the Institute of Bioengineering and Nanotechnology (IBN) of A*STAR to invent an anti-bacterial nano coating for disinfecting frequently touched surfaces such as door handles, tables and lift buttons. 80% of common infections are spread by hands, according to the B.C. [province of Canada] Centre for Disease Control1. Disinfecting commonly touched surfaces helps to reduce the spread of harmful germs by our hands, but would require manual and repeated disinfection because germs grow rapidly. Current disinfectants may also contain chemicals like triclosan which are not recognized as safe and effective 2, and may lead to bacterial resistance and environmental contamination if used extensively. “There is an urgent need for a better way to disinfect surfaces without causing bacterial resistance or harm to the environment. This will help us to prevent the transmission of infectious diseases from contact with surfaces,” said IBN Executive Director Professor Jackie Y. Ying. To tackle this problem, a team of researchers led by IBN Group Leader Dr Yugen Zhang created a novel nano coating that can spontaneously kill bacteria upon contact. Inspired by studies on dragonflies and cicadas, the IBN scientists grew nanopilllars of zinc oxide, a compound known for its anti-bacterial and non-toxic properties. The zinc oxide nanopillars can kill a broad range of germs like E. coli and S. aureus that are commonly transmitted from surface contact. Tests on ceramic, glass, titanium and zinc surfaces showed that the coating effectively killed up to 99.9% of germs found on the surfaces. As the bacteria are killed mechanically rather than chemically, the use of the nano coating would not contribute to environmental pollution. Also, the bacteria will not be able to develop resistance as they are completely destroyed when their cell walls are pierced by the nanopillars upon contact. Further studies revealed that the nano coating demonstrated the best bacteria killing power when it is applied on zinc surfaces, compared with other surfaces. This is because the zinc oxide nanopillars catalyzed the release of superoxides (or reactive oxygen species), which could even kill nearby free floating bacteria that were not in direct contact with the surface. This super bacteria killing power from the combination of nanopillars and zinc broadens the scope of applications of the coating beyond hard surfaces. Subsequently, the researchers studied the effect of placing a piece of zinc that had been coated with zinc oxide nanopillars into water containing E. coli. All the bacteria were killed, suggesting that this material could potentially be used for water purification. IBN has recently received a grant from the National Research Foundation, Prime Minister’s Office, Singapore, under its Competitive Research Programme to further develop this coating technology in collaboration with Tan Tock Seng Hospital for commercial application over the next 5 years. One final comment, this research reminds me of research into simulating shark skin because that too has bacteria-killing nanostructures. My latest about the sharkskin research is a Sept, 18, 2014 posting. This entry was posted in biomimcry, coatings, medicine, nanotechnology, water and tagged A*STAR, Agency for Science Technology and Research (A*STAR), anti-bacterial nanocoating, bacteria-free surfaces, BC Centre for Disease Control, bed of nails, bio-inspired, biomimetics, cicadas, dragonflies, FDA, Guangshun Yi, Institute of Bioengineering and Nanotechnology (IBN), Jackie Y. Ying, nanopillars, prevent bacterial growth, shark skin, Singapore, Singapore National Research Foundation, US Food & Drug Administration, water purification, Xiukai Li, Yuan Yuan, Yugen Zhang, zinc oxide nanopillars, ZnO Nanopillar Coated Surfaces with Substrate‐Dependent Superbactericidal Property on August 15, 2018 by Maryse de la Giroday.